Although I have shared some before and after photos of my renovation on my Instagram, since this site is fairly new I wasn't blogging during a major part of my renovation. I am so excited to share the first of several before and after posts about my apartment and the project that I took on. Let's start at the beginning. I had been looking for an apartment to buy for about two years. As often happens with real estate, it can take time to figure out what you want and my criteria changed over that time. The market and my life also changed during that time...so the search took longer than it probably should have. I ultimately decided that I wanted to go for a two bedroom that was structurally sound, but needed cosmetic updates. I work in the city and often work late, so it needed to have good train access. After some hassle and a let down with another place (an all-cash buyer snapped it up after my offer was accepted), I found the apartment that I was looking for! Getting the keys to MY home for the first time was...pretty amazing. Hey, Future Bev! One day you'll own your own apartment and this phone photo will date you in a big way, You will also still make the same faces that you did when you were two. Baby Bev was right! In 2015 I bought my first home and this is me right after my closing, keys in hand. And I'm sure that children these days have no idea what that object is in my hand in my baby picture. Reenactment of me going into my apartment for the first time as the owner. There were lots of good things about the apartment. Space, location, structurally sound, not too old. At the same time, however, there was nothing special about it. The wood veneer was peeling and there were builder-grade finishes all over the apartment and because it had been used as a rental for over ten years, the floors were badly damaged and there were stains on the walls and ceiling. The kitchen was obviously livable, but I didn't love it. This wasn't a gut job and that was exactly my intention. As you can see below there were large stains all over the floor, which I wanted to change immediately. It's also hard to tell from the photos, but the wood veneer was peeling and damaged. I thought that there were a few small updates that I could make that would ultimately have a big impact. 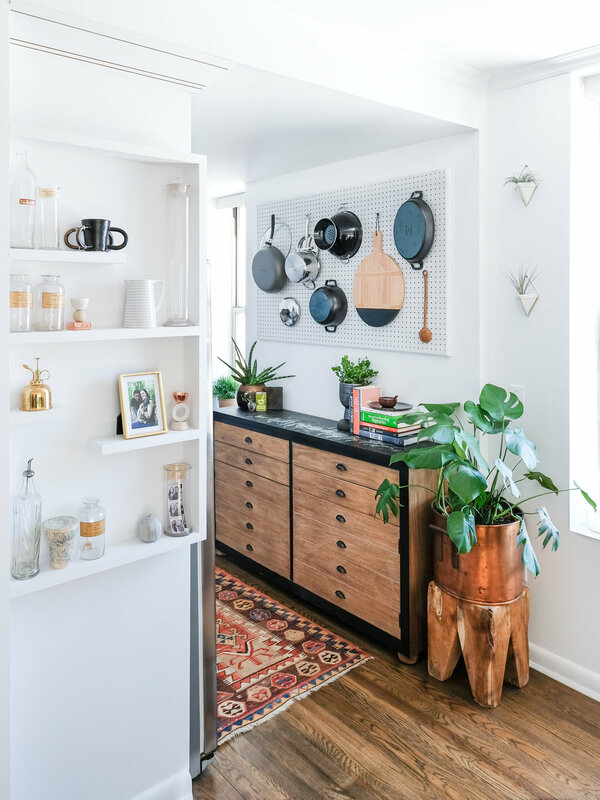 The only thing that I did in this kitchen was paint, add new hardware, and install a pegboard for easy-access storage. I think this renovation goes to show that you don't have to gut renovate to really see some big changes! Decorator's White by Benjamin Moore is a classic for a reason. 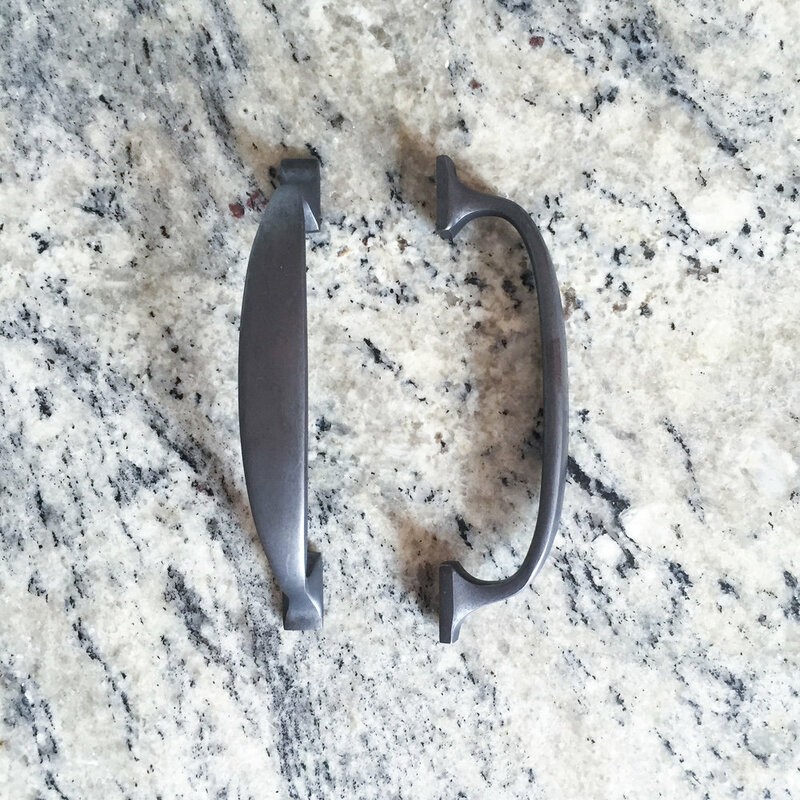 I chose that color for the kitchen and living room and settled on these bistro pulls from Restoration Hardware in an oil-rubbed bronze finish. Immediately after I closed, I hired a contractor and got to work. Here we are on the first day of the apartment renovation and they started work on the kitchen. I would come by every day on my way home from work to check in on the progress. Here are the steps that it took to complete the bulk of my renovation. Fridge in the living room? Nothing to see here! I decided on these oil-rubbed bronze bistro pulls from Restoration Hardware for the kitchen. Step 8: Add A pegboard and decorate! Despite the fact that I didn't make any major changes or upgrades, this space feels like a totally different kitchen. I had always heard on renovation blogs and shows that paint and hardware are inexpensive ways to transform a space and now I am a believer! A kitchen that used to feel dark and small now feels light, airy, and very functional. 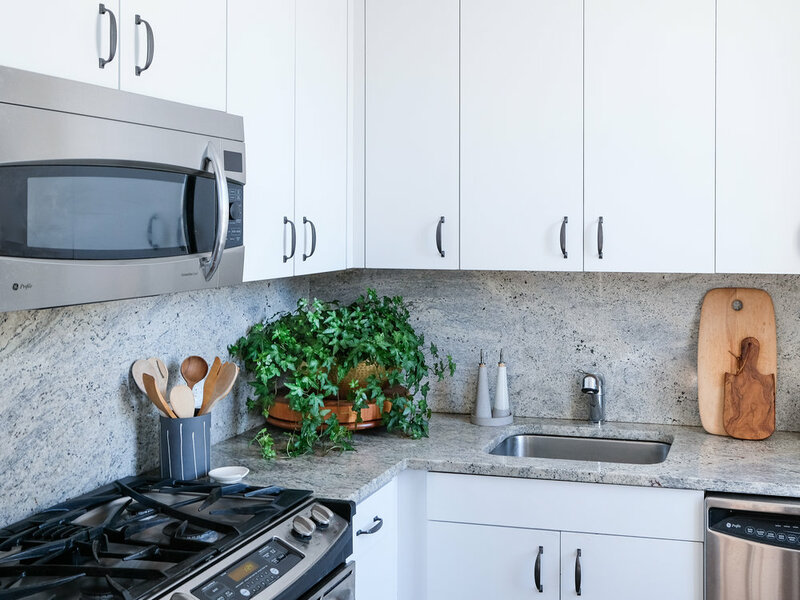 Thank you for reading my kitchen renovation story! I'd love your thoughts what you think of the renovation and also want to hear about your renovation experiences. Let me know in the comments below!